Aviation has evolved to a remarkable level of safety today, thanks to technology advancement and constant training of pilots and crews. When accidents do occur, it is most commonly due to reduced situational awareness, especially poor visibility. Darkness, fog, and rain are the primary enemies of flight, but technology is beginning to provide solutions. Enhanced Vision Systems (EVS) using short wave infrared (SWIR) sensors present pilots with an infrared view of surroundings, penetrating darkness and weather conditions. The use of the SWIR in Enhanced Vision Systems is also key for detecting the landing strip runway lights, which have a peak emission in the SWIR band. Often combined with long wave infrared sensors, enhanced vision systems present a "view ahead" to pilots on a head down or heads up (HUD) cockpit display, namely in Synthetic Vision Information Systems. More on uncooled Enhanced Vision Systems. 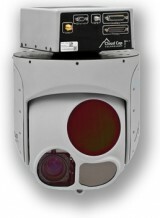 Sensors Unlimited's Indium Gallium Arsenide (InGaAs) focal plane arrays and cameras offer exceptional capability in the critical lightwave range from 900 to 1700 microns where light penetrates fog and mist with little distortion. Sensors Unlimited sensors do not require the complex and costly cryogenic cooling systems found in many infrared imaging systems, greatly increasing reliability and installation flexibility.The exceptional capability of Sensors Unlimited's SWIR cameras to see through rain, mist and fog is demonstrated in the image below. The left side of the image is visible imagery of a landscape by haze. The right side shows clear SWIR imagery of a targeted spot on the scene. See the video below for more details.